The Department of Electrical and Computer Engineering boasts an active and agile research community comprised of our nationally recognized staff, students, and collaborating colleagues. This cadre of scientists is bolstered by grants, both private and public, to further explore our field's unknown horizons. Our department is filled with knowledgeable, astute individuals dedicated to uncovering new ideas and technology in the areas of Bioelectriconics, Communications, Computer Architecture, Nanoelectronics, and Power Systems. Our department encourages these efforts by providing a number of cutting-edge facilities and services to cultivate scientific progress. Our research team is world recognized and funded by top names in both the public and private sectors. 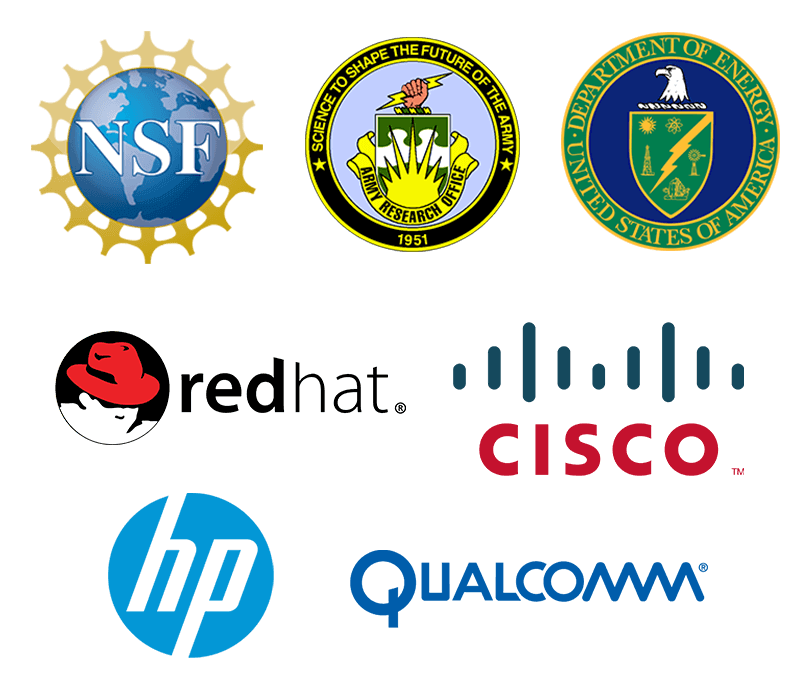 Government organization such as The National Science Foundation, The Army Research Office, and the U.S. Department of Energy, as well as corporations such as Cisco Systems, Qualcomm, Hewlett-Packard, and Red Hat have all allocated resources to further our research and development. Our college has been awarded two Engineering Research Centers (ERCs) by the National Science Foundation. These ERCs are part of a nation-wide group of university level interdisciplinary centers that work in partnership with local industry to pursue strategic solutions to complex engineering problems. ERCs have the potential to revolutionize entire products, systems, methodologies, and industries. This support is a large reason why our college is ranked seventeenth in the nation in research expenditures and fourteenth in industry support, according to the American Society for Engineering Education (ASEE) in 2007. Research in the Department of Electrical and Computer Engineering covers the gamut from basic to applied. Specific topics include not only those under our eight research areas, but themes such as novel ways to teach fundamental concepts, engineering as a life-long discipline, and the engineering education community. The following list represents the projects active during the July 1st, 2016 through June 31st, 2017 fiscal year. Unfunded research is conducted continuously as the scientific curiosity of our faculty lead them to new areas of inquiry. Although we list only the principal investigators from each project, research is typically carried out through collaboration of the faculty, their students, and colleagues. Paleoceanography, among other research fields, depends crucially on ubiquitous ocean dwelling single celled organisms called foraminifera. Undergraduate workers are often employed to pick several thousands of specimens from ocean sediments for each study. Depending on deposition rates and abundance of the species, such manual processing can become tediously repetitive with little intellectual motivation for the undergraduate workers, and time and cost-prohibitive for research scientists. The proposed project aims to develop a completely autonomous system for visual identification of foraminifera. This system will be compatible with existing off-the-shelf microscopes, and will utilize pattern recognition tools that will be made available to the entire scientific community. This project has the potential to enable robotic systems that can perform autonomous picking of foraminifera samples. This project is sponsored by National Science Foundation (NSF). A joint Industry/NSF funded Center will be established as the Center for Advanced Electronics Through Machine Leaning. This project investigates novel ways to enable efficient preemption and effective latency hiding in single-instruction multiple-thread (SIMT) processors such as graphics processing units (GPUs). With the advent of the big data era, there is an increasing demand for data processing. Given their high computational throughput and high memory access bandwidth, GPUs have been widely used, ranging from smartphones, cloud servers, to supercomputers. Although virtualization has been introduced to enable GPUs as shared resource, significant hurdles remain. First, due to the high number of concurrent threads, GPUs have a large context size. Consequently, state-of-art GPUs resort to techniques like draining to complete the actively running threads before context switching. This may incur significant delay and fail the required quality of service (QoS). Second, it is very common that applications fail to fully utilize the computational resource and achieve the peak performance. There are two fundamental reasons. (a) Each thread requires a non-trivial amount of resource. Therefore, only a limited number of threads can run concurrently even if applications themselves have abundant thread-level parallelism. Without a sufficiently high number of threads, the latency hiding capability of fine-grain multithreading is severely impaired. (b) Long latency operations, off-chip memory accesses in particular, need a very high number of concurrent threads to hide their latency. The on-chip resources, however, cannot accommodate such large numbers of concurrent threads. This work investigates compressed sensing methods for millimeter and sub-millimeter wave imaging. It will investigate hardware solutions for compressed sensing masks as well as software and computational algorithms. Agriculture is the primary economic activity undergirding human survival and quality of life and global economic development. To grow agricultural productivity we will establish an interdisciplinary graduate training program to address Plant Production within the Targeted Expertise Shortage Area (TESA) of Food Production. The goals of this program are: 1) comprehensively train three PhD fellows, each in a core discipline within plant production with cross-training in complementary areas; 2) provide experiential training within a technology rich, multidisciplinary research and Extension platform; and 3) graduate students proficient at integrating computational, environmental, biological and physical data into decision tools for increased yield and economic sustainability. This will be achieved through: recruitment of top tier, diverse Fellows; intensive advising and mentoring by exemplary faculty; outstanding academic, international, and industry-based research opportunities; leadership and professional development training, and internships with local Agbiotech companies. Fellowsâ€™ research will be grounded in the innovative research platform (AMPLIFY), a strategic industry-academia- producer partnership conducting interdisciplinary multi-scale systems research to advance high- yield sustainable agriculture to meet our worldâ€™s growing food requirements. Success will be measured by: 1) diversity of recruits; 2) presentations at professional conferences and publication in refereed journals; 3) timely degree completion; and 4) successful placements in industry, academia, or government appropriate to TESA. This NNF is relevant to the USDA/NIFA Challenge Area, Plant Production. Measurable impacts on TESAs include a more diverse scientific workforce trained in skills necessary to address complex challenges facing agriculture. This project is sponsored by US Dept. of Agriculture (USDA) - National Institute of Food and Agriculture. The Modular Multilevel Converter (MMC) has become established in high voltage and power applications due to its ability to split the system voltage into lower module voltages, its high efficiency, and its unmatched output power quality. Despite these advantages, however, the MMC has not made significant inroads in low and medium power applications. The key reasons are the complex monitoring required to ensure module balancing and the inefficient utilization of modules at voltages below the system maximum. Both of these disadvantages stem from the limitation that MMC modules can only be connected in series or bypassed. Addressing this limitation, we have recently proposed and demonstrated a new family of converters that extend the MMC to provide parallel connectivity of modules. Compared to the MMC, the novel modular multilevel series parallel converter (MMSPC) increases efficiency for the same total silicon and allows charge transfer between modules, akin to switched-capacitor topologies, thus drastically simplifying module balancing. This added functionality could open an entirely new space of low, medium, and high voltage applications of multilevel converters. Wireless networks have evolved into a new era, which is going beyond the traditional spectrum that are either licensed and unlicensed. Motivated by the FCC investigation as well as the huge demand for high speed wireless data networks, software defined radio networks that take the advantage of opportunistic spectrum sensing and utilization, have opened the doorway to tactical communications in military communications and many others. Therefore, this project aims to build a small prototype of software defined radio networks, which is composed of three subnets to measure the effects of spectrum congestion, in particular, the cascading failures due to jamming and spectrum interference. This project is sponsored by US Army - Army Research Office. This project will develop a coordinative, real-time adjustable sub-transmission voltage regulation mechanism to promote high penetration of distributed solar generation resources without adversely impacting desirable voltage regulation at the sub-transmission level. Traditionally, voltage regulation devices (capacitor banks, reactors, static Var compensators) are deployed and operated to cope with mainly system load changes. The location, capacity, and operation schedules of those devices are not designed and coordinated for managing the real-time voltage variations caused by variable distributed solar generation resources such as MW- and kW-level photovoltaics (PVs). As a result, insufficient voltage regulations are causing potential overvoltage problems, especially in light load seasons such as spring and fall. The difficulties of maintaining system voltage stability and power quality are roadblocks for PV integration. The success of the project will break those technical barriers in distributed PV integration, reduce the grid integration costs of solar energy and accelerate large-scale deployment of distributed solar generation. This project is sponsored by Pacific Northwest National Laboratory. The NREL III-V Multijunction Photovoltaics Group develops advanced high-efficiency multijunction solar cell technologies for applications including terrestrial concentrator photovoltaics and beyond. The Group is presently engaged in a three-year project to develop five- and six-junction cells with efficiencies exceeding 50%. Accomplishing this goal requires the detailed design, fabrication, measurement, and analysis of the individual photovoltaic junctions; other key components such as tunnel junctions; and the interaction of these individual components in the full optimized device structure. The graduate student hired under this statement of work will work primarily on the project described above, but may also participate in other related Group projects. The student will focus on the top junction and underlying tunnel junction, comparing several options for junction design. This project is sponsored by Alliance for Sustainable Energy, LLC/NREL. NCSU proposes to investigate a platform approach to phased-array design, wherein the system is partitioned into a flexible and reusable â€œcoreâ€ transceiver plus interchangeable mm-wave beamforming â€œextendersâ€ which can ideally be co-integrated using 3D technology. Our approach, entitled Extendable phased-array Platform ICs (EPIC), centers on a flexible fifth-generation cellular (5G) core which will be designed to be reused in any phased-array platform solution operating at 20 to 200 GHz. The goal for the core is to support arrays implemented with any architecture, any technology, and any frequency. EPIC will be demonstrated through the architecting of a 24-44 GHz CMOS flexible transceiver core and then system integration with both existing and newly created prototype SiGe BiCMOS beamformers at 28, 60, and 94 GHz. We will compare EPIC to fully-customized designs to evaluate performance, area, power, and design-time trade-offs of our platform solution to fully custom solutions. This project is sponsored by Defense Advanced Research Projects Agency (DARPA). In this pilot project we are proposing to develop capacitive micromachined ultrasonic transducer arrays with microelectromechanical transmit/receive switches implemented on the same substrate with the transducers. This novel design is intended to ease the burden on the design of frontend electronic circuits used in medical imaging applications. This project is sponsored by National Institutes of Health (NIH). Equipment is requested for the capture of chaotic microwave signals. Recent results have indicated that chaos either superimposed on microwave signals or a microwave signal that is inherently chaotic is in some cases an important component complicating the capture of microwave signals. Chaos appears to lead to phase noise on microwave oscillators, and appears to lead to spurious tones on a vibrating antenna and these are not captured using a spectrum analyzer. A high-speed sampling oscilloscope is required to capture actual chaotic signals. Long capture times and over-sampling are required. The goal of the Resilient Information Architecture Platform for the Smart Grid (RIAPS) project is to design, prototype, document, and evaluate via concrete applications a software platform for use in various networked computing nodes attached to the Smart Grid. The Smart Grid will run on software that depends on a software platform. Just as a revolution in Smartphones was started by Android that enabled all sorts of software â€˜appsâ€™ to run on a wide variety of devices, our vision is that the same principle applies to the development of the Smart Grid, and the design, specification and prototyping of such an open software platform is essential for the growth and proliferation of the system. This project is sponsored by Vanderbilt University. The objective of this proposal is to develop a computational framework that integrates statistical and computational geometric data analysis techniques for the processing, analysis and representation of patterns in order to unleash the potential of physiological and environmental multi-modal wearable sensing health systems for continuous monitoring and tracking of human wellness and physiological state. To accomplish this objective, this proposal will: (1) develop algorithms for the concurrent modeling of physiological, kinematics and environmental states for inference purposes; (2) develop techniques to transform models between different sensing systems in order to make information sharing compatible across platforms; and (3) develop techniques to maximize the impact on the behavior of individuals by elaborating on schemes for data representation. These techniques will empower users and medical practitioners to understanding, analyze, and make decisions based on patterns present in the data. The PI (Subhashish Bhattacharya) NCSU is responding to the NETL RFI number: DE-FOA-0001314 Technical Collaboration Opportunities # 3 for the above titled DOE SunShot based SuNLaMP proposal. In this proposal NETL proposes to develop new power electronics converters using high frequency semiconductors and magnetics for 13.8kV, 60Hz grid connection of distributed photovoltaics (PV) in a modular DC-DC and/or DC-AC cascading inverter designs. This project is sponsored by NETL (National Energy Technology Laboratory). CRADA detailing cooperative research between Scott Walper (Naval Research Lab) and Michael Daniele (NC State) to develop bio/synthetic materials and systems for biosensor and body area network development. Both NRL and NCSU will design the biosensors. Design tasks will include, but may not be limited to, the following: a) Drawings and computer aided design of sensor components and systems architecture. The path of the circuit board traces will be designed and drawn out on computers. Computers will also be used to design the required potentiostat circuitry necessary to produce the biosensor. b) Selection of biosensor recognition agents. The available agents include, but are not limited to glucose oxidase, lactate oxidase, DNA aptamers, antibodies, and peptides. 2. Characterization of Bio/Synthetic Materials: Complete chemical and physical characterization of the bio/synthetic materials will be done jointly. This project is sponsored by US Navy - Naval Research Laboratory. The goal of this project is to develop novel biophotonic devices and systems for studying global hemodynamic parameters in small animals. Such a system would respond to the critical need for small, wireless, minimally invasive systems for recording key physiological parameters during daily living activities in both laboratory environments and natural habitats without disturbing natural behavior and requiring a surgical implantation. The key advance of the proposed work is antennas with metallic conductivity combined with the elastomeric mechanical properties of fibers. Further research is needed to advance these stretchable conductors into antenna applications. Here, we propose a series of studies to realize electrically and mechanically connected stretchable conductors and integrate them into practical antennas. The scope of this work includes developing new stretchable and reconfigurable antenna designs, interconnects to mate flexible conductors to rigid connectors, and an analysis of the electrical, thermal and mechanical performance of liquid metal antennas in realistic operational scenarios. Because of frequent dry periods during growing seasons, producers in this region are increasingly installing irrigation systems to provide supplemental water. The variability of rainfall from year to year and location to location for the same year makes irrigation management in North Carolina challenging. Irrigation water can make up for rainfall shortage during dry periods, increasing crop yield. However, irrigation at the wrong time or at the wrong level may result in saturated soil conditions, yield reduction, increased nutrient loss, and a costly waste of water. Thus, there is a critical need to develop and evaluate irrigation management practices that maximize crop yield and profit, while conserving water, nutrients, and energy. The proposed research will be conducted by a multidisciplinary team within the AMPLIFY framework, which brings together transdisciplinary teams to collaborate on basic and applied research that employs new and emerging tools and technologies to solve complex issues facing growers and industry. This proposal builds on our ongoing agricultural water management research. A smart irrigation system has already been developed in 2014-2015 and requires testing before it can be applied. At the core of the smart irrigation system is a decision support system that determines the timing and amount of irrigation. In this technology, irrigation is regulated based on feedback from soil moisture sensors, weather forecasts and crop sensitivity to dry conditions. The specific objectives of this proposal are: 1) Evaluate two irrigation regimes: I) irrigation applied to meet crop evapotranspiration needs throughout the growing season (no deficit water stress); II) irrigation applied to meet evapotranspiration needs only during growth stages that are most sensitive to deficit soil water conditions. These two irrigation regimes will be compared to a baseline non-irrigated treatment; 2) Evaluate a â€œsmartâ€ irrigation technology to apply irrigation water based on soil water conditions in the root zone, near term precipitation forecast, and crop growth stage; 3) Investigate the effects of different irrigation management strategies on crop physiology and yield; 4) Calibrate, validate, and then apply predictive models to evaluate the effect of different irrigation strategies on crop yield for soils and weather conditions common to eastern North Carolina; 5) Conduct two on-site visits for producers and other stakeholders to discuss results of the study; 6) implement hourly hyperspectral imaging at two critical times during the cornâ€™s maturation and/or at critical irrigation events; 7) Compile the findings of the study into an irrigation management guide. This project is sponsored by Corn Growers Association of NC, Inc..
New agreement for Associate membership. This project is sponsored by Toyota Motor Engineering & Manufacturing North America, Inc.. This PINS is regarding my proposed assignment as Program Director at the National Science Foundation, CISE Division, CSR (Computer Systems Research) cluster, tentatively starting on January 11, 2016. Joining the center as Affiliate Member. Not a renewal since two years between memberships. This project is sponsored by GridBridge. New agreement for full membership. This project is sponsored by New York Power Authority. The topic of Union of Subspaces has recently emerged as a promising alternative to PCA and Robust PCA. In addition to oneâ€™s ability to retrieve a noise-free component satisfying such a model as we have recently shown, we propose to approach the problem as a subspace pursuit problem, much akin to basis pursuit, using the formalism of a Grassman Manifold. We also propose to investigate more challenging spaces where singularities appear and the underlying spaces are not necessarily flat. This so-called stratified space promises to provide additional flexibility to capture sudden changes of scenes in imagery data for instance. design an adaptive range estimation algorithm that considers the real time factors extracted from big-data analysis and updates the range estimation results during the trip. The adaptive range estimation algorithm uses learning techniques such as Stochastic Model Predictive, Artificial Neural Network, Q-Learning, etc. to increase the accuracy of range estimation along the road. This project is sponsored by Samsung Electronics Co., Ltd. - Korea. The objective of this 3-year NSF-CPS proposal is to address three fundamental research challenges required for transcending wide-area communication and control of the North American power grid from a mere optimistic vision to a sustainable reality. Following the US Northeast blackout of 2003 and the subsequent advancement of Synchrophasor technology over the past decade utility owners have gradually started to look beyond the traditional myopic approach of local output feedback and instead use wide-area measurement feedback. However, currently a huge gap exists between implementing such controls using of realistic communication networks in a reliable and economic way. Majority of the ongoing NASPI-net activities are devoted to the hardware architectural planning of aspects of wide-area communication with very little attention to how complicated MIMO control loops, when implemented on top of this communication, may perform under various operating conditions. The vision of this project is to underline the necessity of constructing such an integrated, robust and economically sustainable wide-area communication and control infrastructure by addressing three critical research challenges that stand in its way – namely, (1) understanding how distributed multi-input multi-output (MIMO) controllers dictate and depend on the operational rules of underlying communication systems, and how the two should be co-designed in sync with each other, (2) investigating how wide-area communication can be made economically feasible and sustainable via joint decision-making processes between participating utility companies, and testing how controls can play a potential role in facilitating such economics, and finally (3) exploiting new design ideas of software-defined networks (SDN) so that wide-area communication is not merely a data-transporter but also facilitates the closed-loop dynamic performance of the grid. The RTNN is a consortium of three North Carolina (NC) institutions and is proposed as a site in the National Nanotechnology Coordinated Infrastructure (NNCI) network. NC State, Duke, and UNC-Chapel Hill are all located in close geographical proximity within North Carolinaâ€™s Research Triangle. The RTNN currently offers fabrication and characterization services and education to a diverse range of users from colleges, universities, industry, non-profits, and individuals. The RTNN will bring specialized technical expertise and facilities to the National NNCI in areas that include wide bandgap semiconductors, soft materials (animal, vegetative, textile, polymer), functional nanomaterials, in situ nanomaterials characterization and environmental impact, nanofluidics, heterogeneous integration, photovoltaics, and positron annihilation spectroscopy. The RTNN strengthens the National NNCI in the areas of social and ethical implications of nanotechnology, environmental impacts of nanotechnology, and education/workforce development through interaction with industry and community colleges in the Research Triangle. All facilities engaged in this consortium have established track records of facilitating industrial research and technology transfer, strengths that further leverage the proposed site within the Research Triangle. NSF IPA: Program Director for the Electronic and Photonic Materials Program, Division of Materials Research, Directorate for Mathematical and Physical Sciences at the National Science Foundation. The construction of the single transversal mode microwave cavity in our laboratory has provided us with an extraordinary route to create a new state of amorphous materials in a rather quick and convenient way. The decrystallization process happens by merely subjecting the solid material to a strong E or H field in the cavity. This unique capability opens a new landscape for engineering non-equilibrium structures. There is currently no clear understanding on the E (or H) field decrystallization process. We will adopt novel experimental techniques backed with theoretical modeling to elucidate the field induced decrystallization process. What would be the effect of the E or H frequency, peak power, average power, and the temperature? Is it possible to de-crystallize a material in a preferred crystallographic direction? These are some of the main questions that we will address in this task. We aim to develop a novel class of electronic materials based on bulk amorphous structures including amorphous-crystalline composites and control their thermal and electrical properties. The results are expected to produce new science applicable to functional materials including electronic, optical and magnetic material. We will start with microwave processing of semiconductor ingots. The simple procedure and quick processing time of our method allows investigating a large number of material structures as prescribed by theoretical predications during this program. In particular, we will investigate amorphous based structures of several composite silicide alloys and oxide semiconductors. Our goal is to synthesize amorphous and two component amorphous-crystalline composites of these materials and investigate their electronic, thermal, and optical properties. Amorphous based materials can possess fundamentally different electrical and thermal properties than crystalline or nanocrystalline forms of the same material. Although, amorphous materials have found applications and continue to show promise for modern technologies, charge carrier and phonon transport in these materials remain a point of dispute. The lack of long- and short-range order in amorphous materials leads to complicated interplay between structure and energy transport. We are especially interested in the regime where the carriersâ€™ energy remains at non-equilibrium state due to the consecutive crossing through interfaces of materials with different equilibrium energy distribution of carriers. We will address the multi-mode transport of charge carriers in extended and localized states in disordered multi component amorphous-crystalline composite structures. This is a new scientific problem with many unresolved scientific questions. In particular, a quantum mechanical approach based on non-equilibrium Coherent Potential Approximation will be developed and applied to design complex systems of multicomponent amorphous based materials. Further understanding of charge carrier and phonon transport in such amorphous based materials will directly impact their material design and offer novel material structures for electronic applications. This project is sponsored by US Air Force - Office of Scientific Research (AFOSR). This proposal encompasses the plan to develop a variable node for epidermal biosensors, in which the node has an interchangeable recognition/transduction element that can be modified to act as a biological, chemical or electrophysiological sensor. The proposed node is enabled by a composite substrate comprised of a nanocellulose thin-film that conforms to the skin and carries the printed graphene element. The nanocellulose layer ensures conformal and biocompatible contact with the skin, while a conductive graphene layer provides a high surface- area electrode. While the recognition/transduction element can be exchanged for many different sensing motifs, herein is described the general compositions of a biochemical node (glucose / lactate). The node will measure epidermal conductance (amount of sweat) and a biochemical signal from the sweat (glucose / lactate concentration). The biochemical node is an enzyme-amplified electrochemical system to sense glucose and lactate in the sweat, and an in-vitro prototype will be realized during AY15-16. This project is sponsored by NCSU Advanced Self Powered Systems of Sensors and Technologies (ASSIST) Center. Power-Efficient Respiratory Rate Estimation via Activity Clustering and Minimal Sensing, ASSIST Core Project. The objective of this project is to estimate respiratory rate using inertial, heart rate and other environmental sensing via activity identification. The focus will be on power efficient algorithms that minimize the amount of data sensed, transmitted and locally processed in order to maintain appropriate levels of accuracy while tracking transitions between activities. Strategies for sampling will be developed based on probabilistic graphical models that capture transitions probabilities between human states. The approach will be validated by human experiments at NCSU and UNC. As an additional outcome, experimental trials will be used to record sensing data from existing motion capture systems, and Shimmer and ASSIST platforms for testing and comparing platform capabilities. The protocols and tools developed will be useful for quantifying the performance of systems at executing various inference tasks besides respiratory rate estimation. This project aims to develop a proper methodology for determining the quality of ECG signals and heart-rate estimation. We will compare and contrast: (1) algorithms for real-time denoising of ECG signals and heart-rate estimation on wearable platforms; and (2) the quality of the data from different system platforms including Holter monitors for ground truth, the off-the-shelf Shimmer platform, and dry and wet electrode ASSIST platforms. After this characterization, we will look at implementing machine learning approaches for motion artifact identification based on ECG and inertial sensing information. Determining the specific type of artifact will help select the type of denoising approach to be applied. There are a number of techniques developed for specific noise models that can be elaborated for this purpose. We will finally, perform data fusion from multiple sensor platforms in order to come up with more robust estimation algorithms. Finally, we will explore the usage of the artifact detection algorithms to identify faulty sensors or improper use. The methodology developed for this type of sensing will also be applicable to other sensing modalities (e.g., respiratory rate, blood pressure, etc.). Solar Electric Home Energy Management Program – Task 1. Development of Home Energy Management Systems and Modeling Tools, FREEDM Non-Core Research project. This statement of work is prepared for the Solar Electric Home Energy Management Program sponsored by the Total Inc. There are two main tasks performed by the teams at North Carolina State University under this contract. This statement of work defines the scope of work for Task 1, â€œDevelopment of Home Energy Management Systemsâ€. This task will be conducted by Dr. Ning Luâ€™s and her students. One work package (WP1.X) number will be assigned for each subtask listed under Task 1. Time schedules are developed following a 3-month cycle. Assuming the start Date of the project is Jan. 1, 2015, Month 1 will be aligned with January. This project is sponsored by TOTAL Marketing Services, Inc.. Solar Electric Home Energy Management Program – Task 2.Cooperative Distributed Home Energy Management Systems, FREEDM Non-Core Research project. The goal of this task is to develop a cooperative distributed Home Energy Management System (HEMS) for 1) a single house, and 2) aggregated houses. In this cooperative distributed HEMS, energy sources and loads can coordinate and cooperate with each other to maximize the user comfort, meet the power constraints (e.g., avoid over-loading), optimize the power flows, decrease the system cost and the electricity bill in a single house and among aggregated houses. It also includes smart battery charging/discharging strategies to optimize the integration of the energy storage system. The project consists of design, development and demonstration phases. This project will develop a wide-area communication network for real-time monitoring and control of power systems. The PI will work with his collaborators from UNC Chapel Hill and University of Rochester to accomplish the following three tasks – 1. Develop a theoretical distributed algorithm by which Synchrophasor data feedback can be used for oscillation damping in very large power grids, 2. Develop control techniques for regulating communication delays in software defined networks (SDN) that form the backbone for data transport in the distributed control algorithm developed in Task 1, and 3. Develop discrete-time decision making rules in the SDN by which virtual machines in the network can be rerouted and rescheduled to carry our real-time control actions within stated time-deadlines despite the failure of any given set of machines. Experiments will be demonstrated using the ExoGENI-WAMS testbed developed at the FREEDM Systems Center at NC State. 3DIC technologies have created new advanced DRAM structures. NCSU will build a 3D specific memory controller. This project is sponsored by Air Force Research Laboratory (AFRL). This project aims to develop building blocks towards a theoretical foundation of rapid mitigation of potentially catastrophic disturbances and control of inter-dependent dynamic networks. The nature of the failures and disturbances includes deliberate adversarial cyber-attacks on the infrastructures that are highly inter-dependent, such as tactical ad hoc networks, future power grids, and social networks. Our aim is to ensure large-scale network resilience against cascading failures so as to safeguard physical infrastructures such as the national power grid, transportation grid, and beyond these, the global information grid and defense strategic communication systems. The issues that are deemed fundamental are i) modeling approaches of inter-dependent networks in order to characterize the cascading effects among these networks, such as cascade failure evolution and to identify critical points and correlated events to guard against, ii) vulnerability analysis of cascading failures with respect to network topology, such as network partitions and blackholes, as well as capture the impacts of failures in the spatial-temporal domain, with uantitative and measurable limits and boundary properties; iii) epidemic propagation of failures due to cyber-attacks with and without countermeasure in mobile networks in that the increasing reliance on wireless communications, while offering great benefits of communications in highly dynamic environments, surrenders our information delivery to both active and passive malware attacks. The potential benefits are very promising: preemptive countermeasures can be designed by observing abnormal events, efficient design and planning of networking architectures and protocols for optimal system operation, and more importantly, rapid responses to failures by making the best use of islanding strategies to halt the cascade in progress, and, with minimal cost, damage and casualties, so as to achieve information assurance. Acquisition of a high dynamic range measurement system is proposed which is similar to an existing measurement system but is designed so that measurements can be conducted outside the laboratory and in mobile settings and on actual army vehicle. A vibrating antenna induces intermodulation distortion on a transmitted signal that can degrade communications being received at another frequency. This award is granted towards developing a low cost, low power, low noise, miniaturized, wireless system that can simultaneously record electrophysiological signals (electroencephalography (EEG), electrooculography (EOG)), cerebral hemodynamic changes (Near Infrared Spectroscopy (NIRS)) and head movement (inertial measurements) to study and predict abnormal sleep performance in children (age 2 â€“ 5 years) with Down syndrome. This project is sponsored by Jerome Lejeune Foundation USA. Big data epitomizes DOD application challenges which often invoke a wide array of measurement sensors, including Electro-optical, infra-red, 3D point-cloud sensors and others. All these point to rich and persistent probing of environments and targets which also tend to fill up the ambient space, while the information lies in a low dimensional space. Exploiting the low dimensional information space, which is primarily the goal of many solutions, is one possible way of achieving efficient and important of an online ability to take full advantage of newly streaming data. While great computational efficiency is achieved by properly mapping the big data onto the information space, much work is required in both discovering the adapted maps, and accomplishing the computational capabilities for online processing. Our goal, in proposing this computational infrastructure, is to address some practical aspects of bringing some recently developed algorithms in Imaging and Machine Learning closer to practice and ready deployment. We have over the last five years, put in place, an array of sensors in our Laboratory, allowing us to make measurements and generate real data, and are now ready to attempt the next step of bringing our theoretical and algorithmic development closer to real world application and deployment with adapted computational resources. This 2-year NSF project is a collaboration between MIT (main lead), NC State University, and University of Notre Dame. The main purpose of the project is to develop a suite of novel numerical computational algorithms by which very large complicated mathematical models of large power system networks can be constructed and solved in real-time, or even faster than real-time. The study will involve complex network models of power grids with high penetration of wind and solar power, and their associated stochasticity, and make use of new ideas from algebraic topology theory to develop solutions of those models. Validation will be done using the RTDS-WAMS testbed at FREEDM systems center. The objective of this proposal is to demonstrate the feasibility of producing Ga2O3 based structures for power applications. We intend to explore several growth approaches, aiming to achieve epitaxial structures of high quality. The expected strong potential of this material for producing high power devices will be explored by developing structures with controllable doping. Textiles constitute an obvious choice as multifunctional platforms, since they are worn and used to cover and drape over many of the surfaces around us. They are commonly used to provide protection in hostile environments. The present work proposes a systematic investigation into sensory characteristics of textile structures assembled from multicomponent fibers to produce fiber-based sensory textiles that are capable of generating measurable electrical response under various stimuli. Title: Transcriptional and translational regulatory networks of hormone signal integration in tomato and Arabidopsis. PI: Jose M. Alonso (Plant Biology, NCSU), Co-PIs:Anna Stepanova (Plant Biology, NCSU), Steffen Heber (Computer Science, NCSU), Cranos Williams (Electric Engineering, NCSU). Overview: Plants, as sessile organisms, need to constantly adjust their intrinsic growth and developmental programs to the environmental conditions. These environmentally triggered â€œadjustmentsâ€œ often involve changes in the developmentally predefined patterns of one or more hormone activities. In turn, these hormonal changes result in alterations at the gene expression level and the concurrent alterations of the cellular activities. In general, these hormone-mediated regulatory functions are achieved, at least in part, by modulating the transcriptional activity of hundreds of genes. The study of these transcriptional regulatory networks not only provides a conceptual framework to understand the fundamental biology behind these hormone-mediated processes, but also the molecular tools needed to accelerate the progress of modern agriculture. Although often overlooked, understanding of the translational regulatory networks behind complex biological processes has the potential to empower similar advances in both basic and applied plant biology arenas. By taking advantage of the recently developed ribosome footprinting technology, genome-wide changes in translation activity in response to ethylene were quantified at codon resolution, and new translational regulatory elements have been identified in Arabidopsis. Importantly, the detailed characterization of one of the regulatory elements identified indicates that this regulation is NOT miRNA dependent, and that the identified regulatory element is also responsive to the plant hormone auxin, suggesting a role in the interaction between these two plant hormones. These findings not only confirm the basic biological importance of translational regulation and its potential as a signal integration mechanism, but also open new avenues to identifying, characterizing and utilizing additional regulatory modules in plants species of economic importance. Towards that general goal, a plant-optimized ribosome footprinting methodology will be deployed to examine the translation landscape of two plant species, tomato and Arabidopsis, in response to two plant hormones, ethylene and auxin. A time-course experiment will be performed to maximize the detection sensitivity (strong vs. weak) and diversity (early vs. late activation) of additional translational regulatory elements. The large amount and dynamic nature of the generated data will be also utilized to generate hierarchical transcriptional and translational interaction networks between these two hormones and to explore the possible use of these types of diverse information to identify key regulatory nodes. Finally, the comparison between two plant species will provide critical information on the conservation of the regulatory elements identified and, thus, inform research on future practical applications. Intellectual merit: The identification and characterization of signal integration hubs and cis-regulatory elements of translation will allow not only to better understand how information from different origins (environment and developmental programs) are integrated, but also to devise new strategies to control this flow for the advance of agriculture. Broader Impacts: A new outreach program to promote interest among middle and high school kids in combining biology, computers, and engineering. We will use our current NSF-supported Plants4kids platform (ref) with a web-based bilingual divulgation tools, monthly demos at the science museum and local schools to implement this new outreach program. Examples of demonstration modules will include comparison between simple electronic and genetic circuits. This program for International Research Experience for Students (IRES), will provide U.S. undergraduate and graduate students from NCSU with early career research experience at the Institute of Physics, Academy of Science at Czech Republic (Prague). During focused six-week summer programs, IRES participants will be involved in materials science and will gain hands-on experience with advanced characterization of wide bandgap materials for energy and biosensing applications. This project is sponsored by US Navy-Office Of Naval Research. The objective of this proposal is to formulate a novel methodology for creating secure algorithms in cyber-physical systems and to develop metrics for evaluating the security of composed systems. Cyber-physical systems are composed of interconnected, semi-autonomous devices. The inherently open nature of a CPS implies a susceptibility to attacks that differ fundamentally from conventional cyber attacks. CPS-specific attack vectors exist as purely cyber, cyber-enabled physical attacks, and physically enabled cyber attacks. As such, the endpoints may be fundamentally unsecurable (such as the sensed information from physical resources) or may be compromised (as in computational resources). Creating a secure communications channel between two nodes is inadequate if one of the endpoints of the communication is insecure. Therefore, new methodologies are needed to ensure that the system is protected in the presence of open information flows from physical resources and possibly malicious entities inside the system. Improving plant genetics has demonstrated to be one of the greatest ways to increase agricultural production. Accurate, robust, and reliable phenotyping and quantification of crop yield components are critical for identifying yield traits, understanding their response to environmental conditions, incorporating these traits into adapted genotypes, and developing in-season management decisions. In addition, longitudinal phenotyping provides data needed to develop the next generation of crop growth models and crop management decision aids. We propose research to apply new and existing sensor technologies to plant phenotyping and to validate these technologies on a highly monitored field site. One ultimate goal is to generate a unique remote sensing-based crop phenotyping database as an initial step toward developing a â€œspectral libraryâ€ of crop/canopy characteristics to facilitate rapid phenotyping. The specific objectives are: 1) Collect detailed plant phenotypic information on two maize genotypes grown under two different nutrient management strategies on a highly monitored, intensively managed field site; 2) Use spectral and non-spectral remote sensing to collect information on canopy reflectance, structure, and temperature throughout the growing season; 3) Develop new sensor-based phenotyping technologies based on identification of sensor measurements that can be related to genotypic yield responses; 4) Generate a unique dataset combining sensor, yield, and management information with extensive season-long monitoring of soil, meteorology, and plant growth and nutrient status; and 5) Use these data to calibrate and test an existing crop growth model and a hybrid crop growth-soil drainage-nitrogen dynamics model. This project is sponsored by Syngenta Crop Protection, LLC. This project is sponsored by Duke Energy Business Services LLC. The mission of this study is to design a commercially viable microgrid system solution comprised of proven US manufactured products for export to the Dominican Republic. Positive Energies, L.L.C. (Pos-En) will implement the microgrid design on a pilot project with Consorcio DPSD Holdings (DPSD) upon completion of the proposed design study. Once the microgrid pilot project is technically and commercially verified, DPSD and Pos-En will form a joint-venture company to commercialize the product. The new JV will establish an integrator(s) to package the systems in the US for export to the DR. This project is sponsored by Positive Energies. The QRS complex has been identified as a critical and important waveform in electrocardiogram signals. The time of its occurrence as well as its shape provide much information about the current state of the heart. Although the detection of the QRS complex has been an active research topic for the past 30 years, many of the different implementations have very different characteristics with respect to accuracy, time of detection, preprocessing requirements, peak detection, and performance in the presence of noise and/or signal distortion. Modifications that enable these algorithms to work in real-time have also drawn significant attention. Although others have presented reviews of several QRS detection algorithms and compared their performance in the presence of noise, a formal study that quantifies these algorithms and the tradeoffs associated with modifying these algorithms to work in real- time have not been studied. Our goal in this project is to outline such a study and provide the metrics needed to make calculated decisions on improving real-time QRS detection algorithms. This project is sponsored by NuPulse, Inc.. This project is sponsored by Itron, Inc.. This Accelerating Innovation Technology Translation project focuses on translating a novel Smart Battery Gauge technology to fill the increasing need for accurate battery state of charge (SOC) and remaining useful life (RUL) estimations for stationary energy storage of renewable energy. Although the large-scale integration of renewable energy into the power grid is driving for the growing demand in stationary energy storage, the reliability and safety concern remains as the major barrier that prevents its widespread deployment. The Smart Battery Gauge technology aims to improve the reliability and safety of energy storage systems. As compared to the existing battery monitoring methods, the reliably accurate estimation date generated by this technology will provide systems management and operations with the advantages of improved energy storage system efficiency, reliability, cost-effectiveness, longer lifespan, and reduced capital and operation/maintenance costs. In order to determine the technical feasibility and functional requirements of applying this technology in the stationary energy storage market and provide a commercially valuable solution, this project will result in a software prototype of the Smart Battery Gauge technology to demonstrate its real-time adaptive battery SOC and RUL estimations with market-leading accuracy and reliability, and its flexible customization for multiple different battery chemistries. The objectives of this project are to: 1) Extract the relevant data and models that are needed for RUL estimation, 2) Design the adaptive predictive battery RUL estimation algorithm that can adjust battery parameters with real-time measurement feedback, and 3) Implement and demonstrate the Smart Battery Gauge technology prototype in software and benchmark its performance with existing approaches. This project looks at the novel concept of Virtual Power Plants (VPP) in urban cities. This is grouping of individual consumers who individually generate little amounts of electricity, for example with PV cells, but when taken as a group become a VPP producing more significant amounts of energy. A number of these virtual power plants, which could be at different cities, can also be grouped together to form a more significant power plant or a Virtual Power Network (VPN). The VPN can be treated in a similar way as individual power stations feeding into the grid. Growing urban cities naturally can favour such a development because of the density of consumers, and the availability of investment and existing infrastructure. In order for such VPPs to operate, there is a need to interpret information from many consumers, and then to determine the best way forward to meet peak demand which can lead to outages. Data analytics applied at various aspects of the grid will be needed. At the higher power network side, online measurements of voltage, current, active/rective power from different locations in the grid using GPS-synchronized sophisticated digital sensors called Phasor Measurement Units (PMUs) can be utilised to reduce the impact of islanding and to improve transient stability. This project is sponsored by University of Bradford. This research will investigate radar sub-reflectors using optical modulation of Si carriers. This project is sponsored by Vadum Inc..
–	The optical data will be captured by a 60 cm telescope which is at disposal to CTU Prague team. The radar measurements will be obtained from a Czech amateur radio astronomy network. The optical and radar measurement will be synchronized, i.e. the same orbiting object will be seen simultaneously in both sensor modalities. This project is sponsored by US Missile Defense Agency. Future communication systems will operate in highly complex electromagnetic environments, requiring adaptable architectures where a single compact device can support multiple wireless standards, be resilient to interference, and have degrees of freedom in the spatial and spectral domains. One of the foremost needs for adaptive radios are reconfigurable antennas that can adjust their radiation patterns, polarization, or frequency characteristics. Conventional frequency agile antennas use switches or varactors to modify the frequency response of the antenna; however, these point-based switching mechanisms limit their adaptability. In contrast to a point-based switching approach, this project investigates a new reconfiguration technique by physically reshaping the conductive paths on an aperture using electrically actuated liquid metals. This seed project seeks to go beyond our proof of principle experimentsâ€”which suggest that it is possible to make reconfigurable liquid metal antennasâ€”to identify the capabilities and limitations of this emerging class of antennas. This project is sponsored by UNC - General Administration. Re-joining the center. Affiliate Member. This project is sponsored by NC Electric Membership Corp..
TSC Advantage is joining the center at the Associate level ($15k/yr). They expect prorated membership for FY 2015. This project is sponsored by Tailored Solutions & Consulting, Inc. (TSC Advantage). This project is sponsored by Fuji Electric Co.. This project is sponsored by Virideon Inc.. This project is sponsored by Green Energy Corp. (formerly Plymouth Systems, Inc.). In this project, the team is developing distribution system planning criteria and associated tools for utility engineers for accommodating future integration of distributed energy resources (primarily distributed solar). These tools provide the utility the capability of modeling the impact of uncertain future DER penetration scenarios, quantifying the impacts of DER options and penetrations on distribution expansion and upgrade schemes. This project is sponsored by Clemson University. constraints imposed on CR users. This interdisciplinary proposal aims at making contributions in the general area of security of wireless signals and systems in the context of spectrum sharing, to facilitate the realization of the national spectrum objectives in the years to come. In this project, instead of adding contributions to existing literature on software and wireless network security, we will focus on the vulnerabilities and attacks unique to CR functionalities, and advocate a cross-layer viewpoint for both attacks and defenses. In this project, faster than real time methods to simulate electrical grids will be investigated. This project is sponsored by ABB, Inc. This project is sponsored by NCSU PowerAmerica: Next Generation Electronics Manufacturing Innovation Institute. The NCSU team is going to support the microgrid institute in setting up a test system for the microgrid demo site and study and analyze the microgrid controller design. This project is sponsored by Microgrid Institute. Amorphous based materials can possess fundamentally different electrical and thermal properties than crystalline or nanocrystalline forms of the same material. Although, amorphous materials have found applications and continue to show promise for modern technologies, charge carrier and phonon transport in these materials remain a point of dispute. The lack of long- and short-range order in amorphous materials leads to complicated interplay between structure and energy transport. In this project a novel class of electronic materials based on bulk amorphous structures in the form of amorphous-crystalline nanocomposites will be developed and their thermal and electrical properties will be tailored. The application will be focused on thermoelectric materials, but the results are expected to produce new science applicable to other functional materials including optical and magnetic materials. Parallel to the research endeavors, an educational plan will be implemented which incorporates and develops a new teaching initiative in the upper-division undergraduate curriculum, involves undergraduates in research, promotes student international collaborative research, exposes the field of energy materials to the general public, and provides a resource web-site for advanced thermoelectric material studies. The available resources in the Oklahoma Louis Stokes Alliance for Minority Participation (OK-LSAMP) and Multicultural Engineering Program (MEP) programs will be used for expanding the participation of minority students and the recruitment of high school students. Triangle Microworks is joining the center at the Affiliate level ($2k/yr). This membership is in exchange for an In-Kind contribution of $54,000 worth of software for DNP 3.0 and IEC 61850 and support for three years. They will receive three years of in-kind membership based on an IAB vote. This project is sponsored by Triangle MicroWorks, Inc..
clouds. An in-depth understanding of such questions would greatly help emerging new applications over mobile platform. up with base stations or access points. A wireless miniaturized electro-encephalography and near-infrared spectroscopy system will be developed in the form factors of an adhesive bandage. This system will be used to sort sleep stages during all night sleep of healthy human subjects. The efficacy of the system will be assessed and bench-marked with traditional clinical measurements during sleep studies. This project is sponsored by National Aeronautics & Space Administration (NASA). The goal of this project is to expand the field of view of a two-photon microscope. To this end, the proposed work involves creating a wide field objective and relay lenses the can accommodate a wide field of view. This project is sponsored by UNC - UNC Chapel Hill. Continually increasing water demand (due to population growth) and fuel costs threaten the reliability of water and energy systems and also increase operational costs. In addition, both natural climatic variability and the impacts of global climate change increase the vulnerability of these two systems. For instance, reservoir systems depend on precipitation; whereas power systems demand depend on mean daily temperature. Currently, these systems use seasonal averages for their short-term (0-3 months) management, which ignores uncertainty in the climate, thereby resulting in increased spillage and reduced hydropower. While seasonal climate forecasts contain appreciable levels of skill over parts of the US in both winter and summer, the uptake of these forecasts for water and energy systems management has been limited due to lack of a coherent approach to assimilate probabilistic forecasts into management models. We systematically analyze various scenarios that aim at improving the performance of these systems utilizing the multimodel climate forecasts and a high performance computing (HPC) framework. â€¢Evaluate the tool by running analysis for different test cases and comparing the results conventional production cost tools, such as EOM without modeling water/gas, PROMOD, and PLEXOS. Current optical devices based on InGaN/GaN multiple quantum well (MQW) structures suffer from poor performance at long emission wavelengths due to low quantum efficiency and the droop phenomena. Some of the limitations are related to the very high strain and the accompanied piezoelectric fields present in the InGaN wells. We propose a strain balanced multiple quantum well (SBMQW) structure made of a thick InxGa1-xN template followed by InyGa1-yN/GaN MQW, where x < y. Emerging communication, sensing, and tracking applications continue to require smaller antennas, driven by the form factor of wireless devices. However, while many electronic components benefit from rapidly decreasing size according to Mooreâ€™s Law, antennas face miniaturization limitations when their sizes are below a quarter-wavelength that negatively impact their gain, efficiency, system range, and bandwidth. Due to physical requirements on the amount of electromagnetic energy stored in the near field of resonant structure such as a small antenna, a modulated pulse applied to the antenna inherently experiences some â€œringingâ€ in the time domain. In the frequency domain this is equivalent to a narrowband response. Because of this response, the antenna effectively acts as a narrowband filter, and wideband, short-time pulses cannot be effectively transmitted or received, thereby limiting the data rate. Recent evidence suggests that it may be possible to increase the data rate while maintaining a small electrical size by directly modulating the antennaâ€™s impedance in sequence with the modulated carrier wave applied to the antennaâ€™s feed. However, no comparison has been made between the direct antenna modulation (DAM) scheme and a conventional scheme using typical communications metrics. In this project, we will 1) design and simulate a DAM transmitter and conventional receiver in order to understand how varying signal to noise ratios (SNR) affect key system metrics such as bit error rate (BER) and 2) develop a testbed to generate DAM signals with a reconfigurable antenna in order to characterize the performance of these systems. This project is sponsored by Central Intelligence Agency (CIA). material and COSTS n type material. In particular, the metal contact will be developed and the mechanical properties of the TEG will be improved. In parallel to this effort, we will work on the development of the n type nanocomposites appropriate for body heat energy harvesting. Unfortunately, the n type bismuth telluride alloys have smaller ZT than their p type counterparts mainly due to their low Seebeck coefficient. This is mainly due to lower degeneracy of the conduction band compared with the valence band. Therefore, our focus, in addition to reducing the thermal conductivity by nanostructuring, will be on the techniques for enhancing the Seebeck coefficient such as tuning the composition of the grains, the grain size, the grain alignment, and the grain boundary interface potentials. The grain alignment is especially important due to the strong dependency of the ZT on the crystal orientation in the n type material. the output voltage from mV to V while maintaining similar power density as in bulk TEGs. Fundamental problems in science and engineering have become increas- ingly interdisciplinary, requiring knowledge and expert input from several areas of research. This is both challenging and exciting. The primary chal- lenge faced by researchers is to keep abreast of new developments in tangen- tial research areas to their own, not to mention those which are considered di®erent. The increasing complexity of newly arising problems has on the other hand, invariably required a multifaceted approach to viewing and un- derstanding them, and ultimately produce a solution. To that end, the PIs propose to host a regularly scheduled seminar series with preeminent and leading reseachers in the US and the world, to help promote North Carolina as a center of innovation and knowledge and to ensure safeguarding its place of leading research. This project is sponsored by NCSU Future Renewable Electric Energy Delivery and Management Systems Center (FREEDM). This project is sponsored by Lord Corporation. The main goal of this project is to reduce the cost of RFID chips by eliminating most of the circuitry needed for managing the recovered power on the chip. This has potential to reduce the chip cost by about one-third. RFID chips are at the core of the tags stores typically attach to clothing and high end items â€“ though they have a lot more uses beside this. The main technique employed in this project is to directly operating the circuits from the recovered wireless power. A new chip design technique has been identified for doing this and will be exploited and further explored in the project. This technique also has potential to increase the range at which the RFID tag can be powered. A successful outcome will open new market opportunities to use RFID. While spectral imaging can often detect chemicals in a scene, polarimetry can sense structural effects. Thus, polarimeters have proven effective in the imaging of retinal tissues, and are able to sense tissue degradation due to early onset of ocular diseases, such as glaucoma and macular degeneration. However, current system architectures are limited by low temporal resolution and high cost. To address these concerns, this proposal focuses on the research and development of a new type of rapid snapshot imaging polarimeter that, for the first time, will be capable of real-time Mueller matrix imaging. The polarimeter will be developed for attachment onto a fundus camera to observe the efficacy of real-time full Mueller matrix measurements. This project is sponsored by US Dept. of Energy (DOE). One undergraduate student in summer 2016 will work in close collaboration with the PI and the graduate research assistants currently working on the experimental portion of this NSF funded project. Additionally, the student will participate in the weekly research group meetings where they will be expected to present research results and will present their summer research results as a poster at the NC State Undergraduate Research Symposium in fall 2016. Insect vector-borne diseases affect more than one billion people worldwide. Vector control is one of the most effective means of preventing transmission of these diseases. No new classes of vector control have been developed in decades. Emergence of insecticide resistance to most chemical classes has been observed in diverse pest species and this has become a very serious concern worldwide. Thus, the development of insecticides with novel modes of action (MOA) is of utmost importance in controlling vector borne diseases. A key component for identifying new MOA is the ability to reliably test large collections of compounds for the desired effects again insects and/or destructive behaviors. At the moment in the research and development of insecticides, the rate limiting step to the discovery of new MOA against insects is the efficacy of biological assays and not the chemistry lead optimization process. We propose to build a high throughput screening platform to assess a large number of compounds for toxic, repellent and behavior altering effects that are not evaluated in current standard high throughput biological screening systems. Despite technological advances, no highly efficient insect population tracking system is available on the market that allows capture of their activity in order to characterize many of the chemical effects. We propose to design a platform which will enable us to efficiently and rapidly explore compound collections to unveil their full pest-management potential without the need to pre-filter compounds using other assays. This project is sponsored by NC Biotechnology Center. This project is sponsored by Avista Pharma [formerly SCYNEXIS, Inc]. With the continuing emergence of hostile nuclear threats comes an increasing need for handheld sensors capable of identifying surface chemicals. To meet handheld requirements, the size, weight, and power (SWAP) of optical imaging sensors must be significantly reduced. Additionally, these sensors must be solid-state and/or monolithic, require no mechanical scanning (no moving parts), operate in real time, and must function in harsh environments (e.g. vibration, temperature variations, and movement). The objective of this research project is to develop an ultra-compact snapshot spectropolarimeter. The sensor will be capable of passively interrogating surfaces for chemical signatures with a low SWAP hyperspectral and polarimetric imaging capability. This project is sponsored by University of Arizona. Optical imaging is fundamental and beneficial to many fields of research and science. It can provide non-contact quantification of objects or targets for diagnostic purposes, enable the observation of microscopic objects and organisms, and enable remote non-contact detection and sensing. However, imaging has always been limited in terms of spatial resolution. While many super resolution techniques exist to avoid this limitation, they require scanning near the object of interest or they require a priori knowledge of the target. This proposal addresses the development of a super resolution technique capable of standoff remote sensing. In this five-year program, the PI and team will broadly investigate Geometric Phase Holograms (GPH), Polarization Gratings (PGs), Multi-Twist Retarders (MTRs), and devices that integrate them. This project is sponsored by ImagineOptix Corporation. This project is sponsored by SA Photonics. North Carolina has the environmental and soil conditions that make it favorable for identifying the components of yield and stress responses and developing future high yielding maize genotypes. Research outlined in this proposal seeks to test new sensor technologies to more quickly and reliably identify genotypes with enhanced yield potential and establish baselines for next generation remote sensing. Circuit and radio front-end architectures leading to a universal channel selection filter for the 700-3000 MHz range will be developed. The filter will employ synthetic linear interference delay which provides frequency selectivity based on the creation of an interference pattern arising from delay and phase alignment between between parallel passive and active channels. Fully-integrated filter prototypes will be designed in silicon, including a high-accuracy phase shifter, a limiting amplifier, and low-noise tunable bandpass or notch elements. This project is sponsored by Physical Devices LLC. This is a Collaboration between NCSU and AIST Japan on Spin-Torque Oscillators and Diodes. The collaboration will consists of sharing joint test results and ideas on the fundamental physics, operation and measurement of spin-torque devices. This project is sponsored by National Institute of Advanced Industrial Science and Technology (AIST). This project is sponsored by Control Vision, Inc.. Technological difficulties associated with high-frequency (>20 MHz) transducer arrays have prevented wide adoption of high-resolution imaging systems for many decades. The major technological hurdles for the development of high-frequency arrays have been related to the conventional manufacturing techniques used for piezoelectric transducers. Capacitive micromachined ultrasonic transducer (CMUT) arrays showed over the last decade a great promise for the implementation of high-frequency arrays. In this pilot study we aim to develop novel CMUT designs and fabrication approaches to demonstrate high-frequency (40 MHz and 60 MHz center frequency) wideband (>100% fractional bandwidth) transducer arrays with a curvature in the elevation direction to achieve lensless elevation focusing. The purpose of this grant application is to develop a course (Nanoengineering for the Information Age) that will ingratiate freshman and sophomore students with principle of operation of electronic devices that sense to collect information, actuate to transmit information, and store and process information. The aim of the subaward is to develop hands-on course modules to be embedded as laboratory applications to various existing courses in the Electrical Engineering curriculum at NC State. In the long run, these initial efforts and experiences will help to set-up the related facilities, bring the necessary logistics together and prepare the teaching assistants to be able to offer the proposed ?Nanoengineering for the Information Age? course as an independent class at NC State. This project is sponsored by Cornell University. The objective of this NSF-CPS Synergy proposal is to develop a distributed algorithmic frame- work, supported by a highly fault-tolerant software system, for executing critical transmission-level operations of the North American power grid using gigantic volumes of Synchrophasor data. As the number of Phasor Measurement Units (PMU) increases to more than thousands in the next 4-5 years, it is rather intuitive that the current state-of-the-art centralized communication and information processing architecture of Wide-Area Measurement System (WAMS) will no longer be sustainable under such data-explosion, and a completely distributed cyber-physical architecture will need to be developed. The North American Synchrophasor Initiative (NASPI) is currently address- ing this architectural aspect by developing new communication and computing protocols through NASPInet and Phasor Gateway. However, almost no attention has yet been paid to perhaps the most critical consequence of this envisioned distributed architecture – namely distributed algorithms. Our primary task, therefore, will be to develop parallel computational methods for solving real-time wide-area monitoring and control problems with analytical investigation of their stability, convergence and robustness properties, followed by their implementation and testing against extraneous malicious attacks using our WAMS-RTDS testbed at NC State. Resilience to failures is an important requirement for cyber-physical systems such as Smart Grids that are an integral part of our infrastructure. They consist of tightly conjoined networks of physical components (including generation, transmission, and distribution facilities) interfaced with cyber components (including sensors, communication lines, computational software). Efficient models and online tools for understanding failure propagation and fault source isolation are necessary for building systems that are resilient to failures. Dynamic conditions resulting from varying physical system state such as power consumption, changing operational requirements, physical component degradation, software failures pose great challenges in achieving the desired reliability. We propose to develop (a) new methodology to build fault models for complex cyber-physical systems such as smart grid, (b) develop an integrated system-wide solution for isolating faults and identifying future failure propagation that takes into account the existing protection mechanisms designed into the system. This work will be performed in the context of transmission and active distribution systems of smart grid. However, we believe that this work can be extended to other cyber physical systems as well. The present proposal has the objective to develop, validate and implement an imaging system for the color quality control and assessment of Operation Enduring Freedom (OCP) camouflage substrates. 1)	Obtaining a statistically valid set of pass and fail responses for a large set of camouflage substrates from a group of expert color assessors that repeat their judgments on multiple trials which will be used to train the system. 2)	Developing a numerical algorithm based on an imaging technique that utilizes the above visual criteria to establish instrumental acceptability boundaries. 3)	Comparison of the performance of the numerical models used in the imaging techniques against visual judgments for a new set of test samples. 4)	Prediction of P/F judgments for a variety of substrates. In order to improve the effectiveness of the proposed technique, different types of material (woven, knitted, nonwoven, & different blends) that are commonly utilized in the production of camouflage material in different sectors, should be made available to be visually rated and to train the system. This project is sponsored by US Army. antenna receivers that exhibit the best possible tradeoff between power and bandwidth efficiency. algorithms that sense and adjust the matching networks to changing channel conditions. Development of high-power, Power Amplifiers for high-speed communciation. This project is designed around the new learning-based engineering education paradigm where the students work hard at learning while the mentor listens and guides. ?The guiding? is done on a technology platform according to the needs of the students which are assessed with questions at various levels of difficulty. The instructional design of this technology platform is done by a strong collaboration of mathematicians and engineering educators supported by the instructional software experts. The main goal of the project is to bridge the gap between math education of engineering students and their ability to apply this knowledge and skills in their engineering courses in a way that uniquely meets the needs of the students. Prerequisite math knowledge and skills are introduced as they are needed and in contexts that they will be used with the help of custom created Just-in-Time Assessment and Review modules. Preliminary results show that the proposed approach effectively increases the math preparedness of engineering students and results in improved achievement of course instructional objectives. The objective of the proposed research is to develop compact, high torque density, energy-efficient, rare-earth-material-free electric machines for alternative energy and transportation applications using the concept of transverse flux (TF) paths. The unconventional ?ring? winding producing the homopolar MMF distribution in the airgap used in TF machines allows the increase of pole numbers without the reduction of ampere-turn per pole. This effective increase in current loading makes these machines highly suitable for high-torque, low-speed direct-drive applications. Design innovations in both machine concept and control algorithms distinguish the proposed permanent magnet (PM)-TF structure from those previously developed. The proposed concept has the potential to dramatically increase the torque and power density of electric machines without using rare-earth magnet materials whose cost has increased dramatically over the past five years due to highly limited availability. The goals of this research will be achieved through the following steps: (1) Analyse the electromagnetic, structural and thermal behaviour of the proposed concept; (2) establish analysis, design and control optimization principles for PM-TF machines; (3) design and develop motor controller; (4) fabricate 50kW (peak) prototype; (5) test and analyse performance on an electric powertrain dynamometer; and (6) disseminate results through research publications. A Researcher from National Renewable Energy Laboratory (NREL) has agreed to advise the team and provide technical assistance during the course of this research program. An automotive electric drive manufacturer, US Hybrid, has agreed to provide engineering guidance during the design stage and to help fabricate the prototype. The research efforts will be supplemented by a comprehensive educational plan built around this proposal. Three lecture/laboratory modules on alternative energy and transportation each to cover five weeks of a 3 credit course will be developed at NC State and University of Akron, and also disseminated to other Universities. Several graduate and undergraduate students will be trained through this project. The main objective of the proposed project is to develop a highly sensitive gas sensing system based on a mechanically resonant mass-Â­â€loading sensor coated with selective functionalization layers. The mechanical resonator of choice is a capacitive micromachined ultrasonic transducer (CMUT), which is suitable for array implementation and achieves a high quality factor enabled by a vacuum cavity on the backside of a vibrating plate structure. The array approach is especially important to achieve high selectivity by functionalizing different elements of the array with different polymers. Our target analytes are volatile organic compounds (VOCs). photoacoustic/ultrasound imaging system that will significantly improve the treatment of relatively common forms of heart disease, atrial fibrillation in particular, a form of arrhythmia affecting 0.4% to 1% of the general population and increasing with age. The described devices and systems will be developed based on the capacitive micromachined ultrasonic transducer technology, which employs silicon device fabrication techniques to implement ultrasonic transducers and supporting integrated front-end circuits. This project is sponsored by Stanford University. We seek 76 scholarships over four years to establish a successful program in engineering disciplines for low income undergraduate students at NC State University. This project also includes students majoring in statistics. We will create a pathway through Raleigh Promise for the academically talented and economically disadvantageous student population with a Raleigh permanent address, increasing their opportunities for STEM careers. We have identified several activities in which scholars will have participation priority, including mentoring, career readiness, and educational incentives that have proven to be very successful in academic success. We are proposing to make all need-based scholarship awards the same annual amount of $5500. At the end of this project, we will have effectively increased the rate at which 76 STEM scholars have earned their degree, and built a more diverse and inclusive student population that interacts with and helps recruit new students entering NC State. The objective of this proposal is to perform a basic study of thermal conductivity of AlGaN alloys in the entire composition range with variable defect density achieved by using growth on different substrates and to explore the role of point and structural defects on the thermal transport in these materials. Is Wireless Channel Dependable for Security Provisioning? systems become a key component in our daily life as well as critical cyber-physical systems. Recent progress in this area exploits physical layer characteristics to offer enhanced and sometimes the only available security mechanisms. The success of such security mechanisms depends crucially on the correct modeling of underlying wireless propagation. It is widely accepted that wireless channels decorrelate fast over space, and half a wavelength is the key distance metric used in existing wireless physical layer security mechanisms for security assurance. We believe that this channel correlation model is incorrect in general: it leads to wrong hypothesis about the inference capability of a passive adversary and results in false sense of security, which will expose the legitimate systems to severe threats with little awareness. In this project, we seek to understand the fundamental limits in passive inference of wireless channel characteristics, and further advance our knowledge and practice in wireless security. The objective of this program is to exploit unique advantages of topological insulator based structures for optoelectronic applications. Specifically, the strong magnetoelectric interaction at the topological insulator-magnetic material interface and subsequent band engineering is the key focus as they can facilitate tailored response to an optical signal, offering an ideal environment for previously unattainable performances such as extreme sensitivity detection. The combined theoretical and experimental effort aims to achieve synthesis, fabrication, and analysis of novel topological insulator materials and layered heterostructures as well as demonstration of superior device functionalities. This research program proposes to theoretically exploit the unique characteristics of topological insulator based structures for highly functional devices at room temperature. Utilizing the spin-momentum interlocked nature originating from strong spin-orbit coupling, the key focus is to achieve electrical control of both degrees of freedom that would provide an ideal environment to integrate electronics and magnetics into one nanoscale system. A number of innovative new concepts are put forth by judiciously employing hybrid structures formed with magnetic materials. Specific applications are pursued in three different areas ? multifunctional charge/spin current modulation, nonvolatile magnetic switching, and high sensitivity THz/far infrared detection. The investigation will encompass both the fundamental properties of topological insulators and the device modeling. In particular, first principles calculations will be employed for detailed understanding of the surface states and their interactions with the intrinsic and extrinsic sources. The basic operating principles of the envisioned devices will be analyzed with the development of physical models. Numerical modeling will follow to establish concrete designs as well as realistic estimates of performance specifications. If completed successfully, the proposed research can have significant potential impacts on room-temperature multi-functional spintronics, integration of magnetism with nanoelectronics, far infrared sensing technologies, etc. We propose to develop a conformal miniaturized high-frequency ultrasound transducer array integrated with supporting electronics, to be formed in the shape of a contact lens. This proposal is based on our recent preliminary experimental results showing that the retina responds to focused ultrasound in a similar way to its natural stimulus, light. The proposed device will be designed to project desired ultrasound patterns for direct stimulation of neural circuits in the retina. Such a device has many potential applications including possible enhancement of vision, overlaying patterns on the visual input, or as a prosthetic device to restore vision in blind patients with regenerative retinal disease. NCSU, Sandia and Mentor Graphics Inc. will develop thermal and stress management flows for heterogeneous 3DIC. This project is sponsored by US Army - Research, Development and Engineering Command (RDECOM). This project, just underway, is exploring cross-layer techniques for improving system reliability due to hardware faults in future processors and software. Given the cross-layer nature of this project that includes cooperative hardware and software techniques, it provides an exceptional opportunity for undergraduate students to gain a deep knowledge of computer systems that spans the boundaries of traditional computing disciplines. Furthermore, given the large design space and challenging characteristics of the problems we are working on, there are many opportunities for undergraduate students to get involved and contribute to the research project. In particular, undergraduate students with a basic knowledge of software can code up algorithms that exploit redundancy in software, or they can evaluate techniques within the compiler or hardware and measure performance, reliability, and power trade-offs. Alternatively, students with Verilog coding experience can help implement reliability enhancing techniques for performance and power characterization using standard synthesis tools. By placing some of these activities in the hands of an undergraduate, they gain valuable design and research experience, and it allows graduate students to focus on the most challenging aspects of the project. As minimum feature sizes in microprocessor devices continue to scale down, the susceptibility of hardware to a plurality of faults is increasing. Resilient system design is no longer relegated to high-end, business applications where cost is no issue. Now even inexpensive consumer electronics will need some support for fault tolerance. However, approaches that double or triple system costs by replicating hardware are likely too expensive for consumer electronics, like phones, tablets, or laptops. This project will investigate a new way of modeling and supporting hardware fault tolerance that allows and relies on software and hardware working together cooperatively. The key idea is the design of a system vulnerability model (SVM) which approximates the vulnerability of an application to a hardware error while running on a given hardware platform. Using the model, each layer of the system, for example the CPU, offers knobs which can be tuned to control overall system vulnerability. This allows the design of systems that cheaply provide the right amount of fault tolerance for a given application. These research activities have several broader impacts. The results of this research could impact how future computer systems provide fault tolerance. Ultimately, such impact benefits society by helping sustain the demand for reliable computing devices. In the immediate future, it will support the training of graduate students in this critical area, and it will support enhancement of the undergraduate curriculum at NC State to include topics in fault tolerance. This project is sponsored by Semiconductor Research Corporation. As a member of SWAN (South West Academy of Nanoelectronics) 2.0 led by the Univ. of Texas at Austin, we propose to pursue two tasks in the development of next-generation low-power devices based on emerging 2D material systems including the topological insulators. In the first task, we will theoretically analyze carrier-phonon interaction dynamics and transport of excess heat/phonons in 2D materials and devices. In particular, a first-principles formalism based on density functional theory will be used to establish the intrinsic electron-phonon scattering rates in such candidate materials as transition metal dichalcogenides, silicene, germanene, and bismuth selenide, elucidating the extent of energy exchange in the surface states. At the same time, heat transfer across the layered 2D crystal heterostructures will be examined by using an atomistic thermal/phonon transport model. The second task will entail design and modeling of low-power high-functional logic devices that utilize the spin-momentum interlocked nature of carrier transport in the TI surface states. Particularly, the magnetoelectric effects caused by the neighboring magnetic layers will be the focus of investigation as the key device-enable feature in the topological insulator/magnet structures. Specific device concepts under consideration include magnetoelectric FETs and quasi-optic switches. This project is sponsored by University of Texas - Austin. This project is sponsored by TE Connectivity, LDT. To develop a low cost plug and play solar energy system, costing less than $1.5/W to install. This project is sponsored by NC Department of Commerce. As a part of the UCLA led team, we will investigate two emerging physical systems/mechanisms capable of highly functional information processing beyond the current state of the art. The first task explores electronic properties of van der Waals materials and their heterostructures. Of primary interest is a system utilizing atomically thin tunnel structures and engineered density-of-states mismatch for ultra-high-speed operation in the terahertz frequencies and strong nonlinearity. The second exploits the possibility of inducing and controlling strongly correlated interactions between electronic and magnetic systems. Specifically, a layered structure consisting of non-metallic magnetic materials and low-dimensional semiconductors with large surface area, such as the van der Waals crystals, is the focus of investigation. The key concept utilizes the correlation between two materials through interactions at the interface, enabling modulation of one property through the other. Detailed theoretical analyses coupled with numerical modeling will be conducted to demonstrate the underlying physical concepts. Relevant metrics will be estimated to gauge the performance in realistic applications. This project is sponsored by University of California - Los Angeles. This project is sponsored by Cree, Inc.. This project is sponsored by TOTAL American Services, Inc.. This research investigates magnetostatic spin-wave generation, propagation, interaction and absorption in multi-layer Giant magnetoresistance (GMR) and Tunnel magnetoresistance (TMR) spin-torque oscillator (STO) arrays. With the recent demonstration of spin-torque transfer and self-sustained oscillators, a new class of oscillator has emerged with extreme tunability and potential for excellent RF performance. Recent results have shown, however, that the potential of these new devices is limited by the large phase noise of individual devices due to the small amount of energy stored in a single device. A potential solution is the phase-locking of many STOs in a large array. This research focuses on the fundamental science of STO-STO interaction in multi-device arrays with the goal of laying the foundation for controllable, scalable arrays of STO oscillators. Specifically, this research proposal focuses on three tasks investigating fundamental science of spin-wave STO interaction: 1) Study of magnetostatic surface wave dynamics on multi-layer STO stacks, 2) Study of magnetostatic surface wave stimulated emission by an STO, and 3) Spatial dependence and scaling of STO-STO interactions. This project is sponsored by SAS Institute Inc.. Autonomous navigation in unknown and dynamic environments has been a major challenge for synthetic mobile robotic agents. On the other hand, insects can easily solve such complex navigational problems and demonstrate remarkably stable and optimized locomotion skills in almost any environment. This project aims to develop a mobile sensor network where insects are used as mobile biological-robotic (biobotic) nodes. Insects, in fact, build a ?natural? sensor network through the use of their biological sensing organs and release of chemical, mechanical and optical cues to communicate the information to the rest of the group. In the scope of this project, a novel ?cyber-physical? communication network will be established among the individual insect in addition to the aforementioned natural one. For this, insects will be equipped with synthetic electronic sensors to sense additional cues, neuromuscular stimulation systems to direct the control of the insect and microcontrollers with radios to establish an RF link between the insects. This novel network will enable operation of insect biobots in complicated and uncertain dynamic environments for applications such as environmental sensing and search-and-rescue operations after natural disasters. The unique interdisciplinary nature of this project will help us to reach to younger generations and train them to be able to look at engineering problems from a cyberphysical systems point of view. Planned activities include development of lab modules and demos by undergraduate and graduate students to teach K-12 students and their teachers through our on-going collaborations with educational partners. These demos will also be instrumental during our nation level efforts to promote graduate education to underrepresented minority students. Recent phenomenological investigations of the fundamental limits to the performance of radio, radar and sensor systems have revealed radio-frequency (RF) interference effects that do not have the expected integer calculus descriptions. Some of these effects derive from electro-thermal diffusive interactions and it is believed that many other effects similarly derive from diffusion. Also, time-frequency effects have been discovered in which the temporal response of electronics excited by a pulsed RF signal is significantly longer than linear frequency-domain analysis would imply. It is believed that these derive from diffusion-like effects as well and require fractional calculus. The project?s premise is that using integer calculus-based analysis has resulted in sources of interference in RF systems being missed. This project investigates the underlying physics of diffusive RF phenomena. Time-domain fractional calculus-based descriptions transformed into the frequency-domain become non-Laplacian (i.e. non-integer-based). However, conventional analysis of RF structures is based on integer-based Laplacian frequency-domain analysis derived from integer calculus. The project extends the engineer?s RF analysis toolkit to include non-Laplacian models and abstractions. The work will lead to new paradigms for understanding interference at RF, for enhancing RF systems, for deriving fundamental limits of performance at RF, for developing signatures, and for manipulating RF electronics. This project will take a unique approach in examining how management and control of large-scale and distributed energy resources can contribute to both stabilization and improving the performance of for power systems with high penetration of renewable energy. The research will involve a system theoretic end-to-end analysis from detailed characterization of the energy sources through propagation of these inputs through the power transmission and distribution network. An important aspect of the proposed research is the ability of this interdisciplinary team to examine not only the technical and physical system challenges but to include the related regulatory, policy and market challenges that must be dealt with in order to implement any proposed power system changes. Motivation: A ubiquitous feature in many signal processing systems is to learn the input statistics from historical data. In these systems, Bayesian methods perform statistically optimal signal processing. However, there are applications including file compression, speech recognition, network monitoring, and compressed sensing in which it might be impractical to learn the statistics a priori. In such applications, a statistical approach that adapts to the data at hand must be used. The information theory community has championed the use of universal algorithms, they achieve the best possible statistical performance asymptotically despite not knowing the input statistics. These algorithms have had tremendous impact in lossless compression, where the goal is to describe data as succinctly as possible while allowing a decoder to reproduce the input perfectly. In sharp contrast, universal algorithms have had little impact on other areas. GEH system integration and validation of three LV-SSTs tied to MV FREEDM lab GEH grid with DRER (PV) and DESD (BESS â€“ Battery ESS) to demonstrate DGI based IEM and IPM functionalities, including islanding, and black-start (Grid Forming) in a microgrid platform. According to the strategic roadmap of the center, development of SiC based solid state FID and hybrid FID are critical to meet the centerâ€™s strategic vision. In Year 5, a solid state based FID (Gen-II FID) has been developed and integrated into the GEH testbed. In Year 6, the development of hybrid FID(Gen-III FID) was underway as a collaboration project between FSU and NCSU. This is a continuation of this project and will result in the delivery of a Gen-III FID in Year 8. This project aims at developing flexible thermoelectrics devices to harvest energy from the human body. Two approaches are being considered. In the first approach, a flexible package is developed to integrate thermoelectric legs grown by an epitaxial growth technique. In the second approach, polycrystalline thermoelectric materials are grown selectively in a flexible package. The ultimate goal is to integrate these devices on a flexible platform such as a wristband. The aim of this project is to provide a low power photoplethysmogram (PPG) and pulse oximetry system where we will focus on enhancing the power consumption of the analog front-end and the performance of the optical elements. We will also integrate this system to Health and Environmental Tracker (HET) testbed to monitor various physiological parameters and correlate these with blood pressure, onset of asthma attacks and stress levels of subjects. The project focuses on comprehensive understanding of electrical and thermal transport in the chalcogenide nanocomposites and heterostructures through application of a multiscale modeling approach. While the chalcogenides in the bulk form (e.g., Bi2Se3xTe3(1-x)) already possess superior TEG characteristics compared to other materials, significant further enhancement (with zT over 2) may be possible through judicious tailoring of electronic and phononic band structures as well as the related transport dynamics in the engineered nanoscale structures. For instance, one particular advantage of the chalcogenide based structures is that the impact of heterointerfaces could be rather uneven in the electronic and phononic subsystems, opening the possibility to optimize one subsystem rather independently of the other. At the same time, there is a need to comprehensively explore nanoengineered chalcogenides considering the significant promise that nanocomposites offer. Along with the effort on the active element of the system (i.e., TEG materials and structures), our theoretical investigation also extends to the interfaces between the device and substrate (body) as well as at the other end of the TEG unit (heat sink; ambient). The small temperature difference between the body and the ambient makes it very crucial to minimize the temperature drop across the parasitic components. For accurate descript of electronic and phononic properties with predictive capability, the proposed analysis utilizes a multiscale modeling approach that encompasses numerical tools ranging from atomistic calculation (based on a first principles method) to meso- and microscopic treatments (such as semiclassical Boltzmann transport simulations). The investigation is pursued in close collaboration with the groups led by Profs. Ozturk and Vashaee at NCSU as well as Phononic Devices. The ultimate goal is to provide, through theoretical means, design guidelines for experimental demonstration of efficient TEG devices capable of delivering the system power needs. Funding is requested to supplement the ongoing work in the ASSIST ERC. This particular solicitation provides the option to submit a full proposal or request a supplement up to $200K. Adolescence is a critical period for the maturation of cognitive and emotional networks that control stress regulation. Aberrant maturation of brain circuits controlling these domains of cognition results in increased risk and vulnerability for a whole host of neuropsychological and neuropsychiatric disorders. Yet, little is known about the day-to-day stress response markers, and neurophysiological psychosocial mechanisms that contribute to stress vulnerability and risk for cognitive and affective impairment. Most data collection methodsâ€“to-date depend on laboratory measures, often lacking ecologic validity, and fail to capture real-life day-to-day momentary individual physiological reactivity. Wearable electronics designed for continuous monitoring of physiological functions such as heart rate, motion, cortisol, brain EEG activity and speech output will provide significantly more information about physiological markers of cognitive and affective processes, as well as stress response and recovery, as adolescents engage in their daily routines. Combined with time stamping, the technology will provide information about the role of specific psychosocial factors in the perturbation of individual adolescents neurophysiology. The system consists of a self-powered wearable armband with sensors for EKG, body motion, cortisol and temperature, as well as sensors to acquire brain electrophysiological responses and states, using small EEG recording devices. We will deploy these new electronics in the field to track physiological and psychosocial markers in adolescents ages 9-16, who are undergoing brain imaging and EEG tests in the laboratory environment, as well as stress response and recovery evaluations. Individual differences in brain function, emotion regulation, and cognition evaluated in the lab will be related to electronically acquired ecological measures during the subsequent week and self-assessment entries recorded on mobile devices by participants. The present study offers the unique opportunity to use mobile technologies to conduct both â€˜light touchâ€™ surveys (e.g., texting adolescents to gather small bits of information about their health or substance use) as well as more intensive ecological momentary assessment (EMA) surveys that could track behavioral patterns and daily psychosocial triggers. Our plan is to build on the success of our recently proposed data-driven methodology of time delay embedding for efficient and effective detection of wheezes/wheeze onset (along with their frequency estimation) in breathing signals, to develop a multi-signal/multi-modality framework with a capacity to causally correlate them, and to subsequently fuse extracted information for further interpretation and inference, in a form of a platform for assessment and advisory purposes to an individual. Specifically, we propose to similarly account for the intrinsic structure of multiple time series (ECG, Blood Pressure, Breathing, Ozone level, etc.) and investigate their joint exploitation, with a goal of unraveling their potential correlation (joint exploitation) and causal interactions. Specifically, we propose to develop a holistic integration of various human physiological measurements together with prevailing environmental condition measurements in the first stage, as states of a dynamical system, which by way of time delay embedding modeling, may be characterized by the resulting phase space. We maintain that this will also provide a quantitative measure of this notion of causal interaction among the states/times series. In parallel, in an additional initial and secondary effort, we propose to investigate an important and emerging entity, namely EEG measurements to provide and integrate a timely â€œstate of mindâ€ of an individual which are associated with the other measured physiological measurements. While this effort may look more futuristic in essence at this point, we believe, it is an important data modality in light of the up and coming new applications. While our immediate plan in this proposed work is for the available/soon to be time series measurements, our proposed analysis and exploitation approach will be readily applicable to future measurements, as real time performance, as in our earlier work, will be central. The higher-level exploitation of the gleaned information, and as a goal demonstration platform will be in a form of an assessment/advisory tool available to an individual, and we refer to as a Health Assessment Tracker. Through interdisciplinary doctoral education in Nanoscale Electronic and Energy Materials (NEEM), North Carolina State University (NC State) proposes to increase its commitment to interdisciplinary graduate training in electronic and energy materials related to nanotechnology. This interdisciplinary field comprises several areas designated by the GAANN Program as critical to national need: Chemical and Biomolecular Engineering, Chemistry, Electrical and Computer Engineering, Materials Science and Engineering, and Physics. Our goal is to enlarge the pool of U.S. citizens and permanent residents who pursue teaching and research careers in nanoscale electronic and energy materials, thereby developing the academic and research infrastructure and increase U.S. competitiveness. This project is sponsored by US Dept. of Education (DED). In this proposal, we present a novel paradigm for identifying putative cis-regulatory promoter targets that control the regulation of stress responses in plants. This paradigm will also be used to identify critical regulatory components that differentiate the regulatory stress response across different cell types. We first develop the computational and analytical infrastructure needed to build a dynamic model of the gene regulatory network from time-course transcription profile data that quantifies the stress response. Novel analytical model refinement techniques are proposed to reduce the space of feasible solutions, generate specifications for model validation experiments, and test functional redundancy in the response. Parallel computing architectures will be used to scale the implementation of these model refinement approaches to the size and complexity associated with gene regulatory networks. The dynamic model of the gene regulatory network will be used to identify relationships between genes, build corresponding functional modules, and identify putative cis-regulatory promoter targets and regulatory components that can be used to alter responses to biotic and abiotic stresses in plants. Previous cell-specific transcription profiling has indicated that cell types have distinct expression profiles and respond differently to stress. We will generate cell-specific time-course transcription profiles using experiment specifications derived from the dynamic gene regulatory network. These data will be used to create a cell-specific dynamic gene regulatory network for identifying regulators that are key in differentiating the stress response between cell types. throughput and smaller delay in multihop wireless networks, to list a few. Except for small-sized, static networks for which centralized design is not much of an issue, virtually all large networks necessarily demand distributed algorithms for inherent lack of global information and also randomized algorithms for autonomous load balancing and their resilience/robustness against possible points of failure/attacks, yet often with close-to-optimal performance. For two decades, personal computers and servers have been powered by increasingly sophisticated superscalar processors. The last few years has even witnessed the introduction of superscalar processors into smart phones and tablet PCs, in order to provide richer user experiences. There are important trends in both domains: server-class processors require unsustainable design effort, as evidenced by a select few, highly trained, large design teams in industry proliferating superscalar processors; mobile devices are evolving at an extraordinary pace. These trends suggest it is time to take a radical departure in the way superscalar processors are designed. In particular, the PI proposes superscalar processor design automation. This project explores challenges and solutions at key levels: (1) automatic FPGA-based processor-in-system exploration, (2) efficient and automatic ISA/microarchitecture decoupling, (3) automatic RTL generation via a superscalar design language, and (4) a low-effort physical design strategy and alternative to custom design. Bridge processors from Intel and accelerated processing units (APUs) from AMD are such examples. However, current fusion architectures mainly take advantage of form factors and CPUs and GPUs operate very similar to discrete parts. In this proposal, we make the key observation that fused CPU-GPU architectures enable new opportunities to address important challenges in either CPU computing or GPU computing, which is also referred to as general-purpose computation on GPU (GPGPU). We propose novel CPU-GPU collaborative execution paradigms, in which CPUs and GPUs execute programs in a synergic manner. In CPU-assisted GPU computing, CPUs runs ahead either to warm up the shared data cache for GPU threads or to inform GPUs the thread organization for incoming divergent branches so as to improve the GPU resource utilization. In GPU-assisted CPU computing, GPUs will either profile the locality of CPU programs to improve the memory hierarchy performance or monitor the run-time anomalies to enhance the reliability of CPU execution. This is an International Collaboration Supplement (ICS) request in conjunction with our NSF project # 1207075 titled “III-Nitride LED structures on sidewall grown semipolar facets”, aiming to bring an additional strong scientific component that could leverage the success of the current program. The supplement will also enhance a productive on-going international collaboration with a spectroscopy group from the Institute of Physics, Academy of Sciences of the Czech Republic. The available bandwidths at Ka band and V band enable gigabit-per-second communications for mobile millimeter-wave broadband networks using compact beamforming antenna arrays. In year 4 of this program, we will be building upon our previous work to realize a low-noise, power-efficient front-end at 60 GHz in SiGe BiCMOS technology with built-in test. This project is sponsored by Samsung Research America Inc..
NCSU is requesting a supplement for one year from NSF to be able to carry out and finish few tasks that were not done yet. NCSU logger is 554351. NSF reference number is -ECCS:1102060. This supplement will allow us to integrate the GaAs junction with SBSLS with an InGaP top cell using a connecting tunnel junction. Volt/var control is one of the key applications on a FREEDM system which require fast response. In last three years, PI have developed algorithms for this application. The first application involves using directional Overcurrent Relays with a pilot signal to provide alternative protection for the FREEDM system which does not require very fast communication. The second application involves a volt/var control scheme to provide voltage control on a FREEDM system. A distributed control scheme has been developed for this purpose. ST1 (Baran): Benefit of Volt/Var control and Advanced protection on FREEDM systems. This subtask aims at conducting comparative studies on a prototype FREEDM system in order to assess the effectiveness of Volt/Var control and System Protection on a FREEDM system as compared to a conventional system. This assessment can then be used to do cost/benefit analysis on the FREEDM systems. Plant cell walls are the essential components of feedstocks for biomass based liquid fuel alternatives to petroleum. The secondary cell walls of woody plants contribute greatly to biomass and are targets for improving potential feedstocks. In the application of systems biology to development of new biofuels, as in any complex biological process, predictive modeling is the central goal. We propose to use a systems approach with genome based information and mathematical modeling to advance the understanding of the biosynthesis of the plant secondary cell wall. To do this, we will use multiple transgenic perturbations and measure effects on plants using advanced quantitative methods of genomics, proteomics, and structural chemistry. The combination of quantitative analysis, transgenesis, statistical inference and systems modeling provide a novel and comprehensive strategy to investigate the regulation, biosynthesis and properties of the secondary cell wall. Work will be conducted on a new unified memory device. This project is sponsored by Florida Power & Light Company. This project is sponsored by Intel Corporation. This NSF-CAREER proposal strives for novel and transformative approaches to formulate, investigate and validate the almost untouched problem of wide-area damping control of large-scale electric power systems using synchronized phasor measurements. Following the US Northeast blackout of 2003, tremendous research efforts have been devoted to the visualization and postmortem analyses of Synchrophasors, leading to a formative understanding of how the Wide-area Measurement System (WAMS) technology may be used for dynamic health monitoring of complex power system networks. However, owing partly to a slowness in learning, and partly to a shortage of control system engineers in the WAMS community, no rigorous research has yet been done to transcend from monitoring to the next phase – namely, feedback control. With over 132 Phasor Measurement Units (PMU) currently operating in the US West Coast power system, and over 60 PMUs operating in the Eastern Interconnect, producing over 2 billion data samples per day, control by human operators is obviously not sustainable. An autonomous, highly distributed, bandwidth-efficient, real-time control system is needed to shape the oscillatory dynamics of these interconnections using Synchrophasor-feedback. This project will make a step towards building such control systems, using concepts of nonlinear circuit theory, fundamental physics, and graph theory. This project investigates microarchitectural techniques to achieve high performance and energy efficiency for single threaded applications. This project comprehensively addresses the control-flow problem in high-performance processors, to significantly improve their performance and energy efficiency. Based on the strategic research roadmap and comments from NSF site visit team, the key role of the Gen III SST is to clearly differentiate the FREEDM SST from the existing development activities and to reliably serve as a practical testbed for the Post Silicon Device and the Distributed Grid Intelligence (DGI) with intelligent energy management (IEM) and intelligent fault management (IFM). Moreover, Gen-III SST serves as a key node to effectively validate the multi-layer hybrid control robustness and overall system operation reliability. Different applications achieve their highest performance on different processing hardware. The goal of this project is to design a universal computer architecture that can achieve the same effect as custom-fabricating the optimal processing hardware for arbitrary application behaviors. adversary has access to the secret key. The Green Energy Hub testbed is an integrated hardware system demonstration incorporating technologies from the Enabling Technology and Fundamental Science research planes. FREEDM Systems Center Membership – Associate Member. This project is sponsored by Huawei Technologies Co. Ltd..
Second renewal membership for PJM. This project is sponsored by PJM. The objective is to develop a comprehensive FREEDM system level model for system performance analysis, and controller design and evaluation to address one of the most critical concerns of the NSF SVT. A distributed or autonomous robust Intelligent Power Management (IPM) Control development is a key component of the controls initiative in Year 7. This project is sponsored by Electric Power Research Institute, Inc.. This project is sponsored by Southern California Edison Co. (SCE). This project is sponsored by Eaton Corporation. As a part of the NSF Center to Centre trilateral collaboration with Ireland and Northern Ireland, the FREEDM Systems Center engaged research entities in both jurisdictions to understand the challenges to high levels of distributed renewable energy. As a result of this engagement, a research roadmap between the Marine Renewable Energy Ireland (MaREI) Centre housed at University College Cork and Queens University Belfast (QUB) in Northern Ireland was established. This research roadmap investigates the cross cutting nature of decentralization and electrification through communications and incentivization by performing a host of modeling and simulation to seek optimal solutions. The IFM functionality requires semiconductor switches that can rapidly turn-off line currents whenever a fault is detected by the system. The semiconductor device must be capable of supporting the peak AC line voltage in both directions. It must have low on-state voltage drop to reduce power losses during normal operating states of the system. At present, the FID has been implemented in Gen-I using 6.5-kV IGBTs with a series diode to provide reverse blocking capability. This combination has an on-state voltage drop of nearly 15 volts because three 6.5-kV silicon IGBTs and three 6.5-kV silicon diodes are connected in series. The present configuration cannot provide fault current limiting. This project is sponsored by National Institute of Aerospace.